« Where does Netflix Download Shows to on Windows 10? Before you get your hopes up that it contains anything uber cool, it does not. Still, it is the first build that is going to get updated frequently in the coming months before that next feature update is released near the end of the year. Microsoft, as always, has not revealed a date for the second update. It seems likely that it is going to be released in the fourth quarter of 2017, and not earlier though. The Windows 10 Insider Preview build 16170 is already available for Fast Ring devices. Just open Windows Update on the device and run a check for updates to have it picked up and downloaded to the system. Microsoft published a blog post that details the changes, improvements, fixes and known issues of the build. Microsoft fixed the error 8024a112 that some users got when they installed a new build and rebooted the PC afterwards. The share icon in File Explorer has been updated so that it matches the share iconography better. Fixed that Cortana Reminders was listed as a Share target when Cortana was disabled on the PC. Fixed an Miracast issue where the connection was closed shortly after it has been established after the Connect UI was closed if the connection was a first time pairing. Fixed a high-DPI issue when System (Enhanced) scaling is enabled. If you turn off the Night Light schedule in Settings, Night Light gets turned off immediately. Narrator does not work in the 16170 Build. Users are asked to move to the Slow ring if they require Narrator. Some updates were cancelled issue. This is investigated by Microsoft right now. The restart reminder to complete the installation of updates may not pop up. 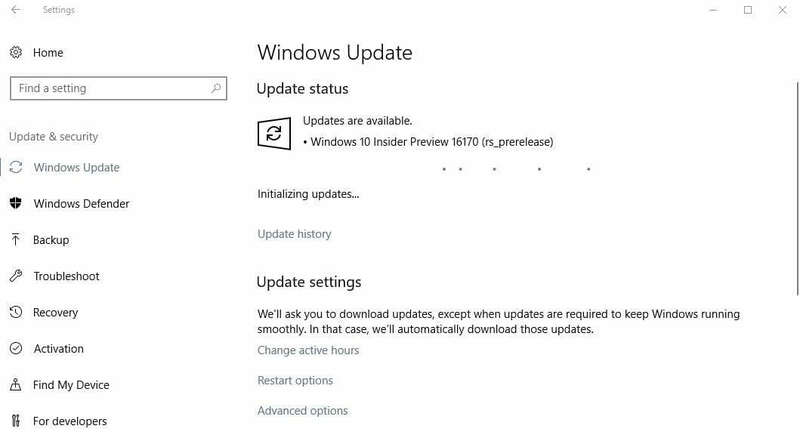 Users are asked to visit Settings > Update & Security > Windows Update to see if an update is required to complete the installation. The broadcast live review window of the Game Bar may flash green under certain hardware configurations. Microsoft advises to install the latest graphics driver. Windows Defender cannot be opened with a double-click. You can right-click the icon and select the open Windows Defender option to open the security program. Surface 3 devices fail to update to new builds if a SD memory card is inserted. A focus issue with the Developer Tools in Microsoft Edge. Dismissing one notification in the Action Center may dismiss multiple. While the build is unspectacular, it does mark the beginning of the next feature update development phase. This entry was posted on Monday, April 10th, 2017 at 11:17 am	and is filed under General News. You can follow any responses to this entry through the RSS 2.0 feed. Both comments and pings are currently closed.